Victoria Willis, 16 year old junior at Archbishop Spalding High school was awarded the title of Maryland Lamb and Wool Queen 2010-2011 on Friday, April 30st; the day before the MD Sheep and Wool Festival began. Victoria resides in Pasadena , MD. The contest began in 1972, and Victoria is the first recipient from Anne Arundel County, Maryland. Victoria raises her own herd of sheep, which she keeps at Kinder Farm Park through the Kinder Farm Park 4-H Livestock Club and also rents land in Millersville, MD for a few other sheep; in total, she currently has 7 sheep; Romney and Rambouillet sheep, and takes them to shows throughout the summer. Victoria is a junior member of the American Romney Breeders Association and has been showing and breeding Romney sheep for the past 5 years. 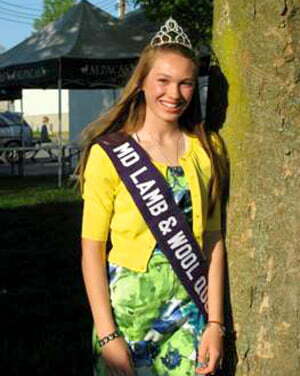 The MD Lamb and Wool Queen contest was made possible by the MD Sheep Breeders Association. Victoria’s duties include handing out ribbons for sheep shows at the MD State Fair, and other fairs, and doing lamb promotions throughout the year.